We’ve got decades of experience behind us. The predecessor of the present-day PRO-WEST (Professional Western Rodeo Association), the WRA (Washington Rodeo Association), was formed by a small band of contestants in 1967. Today, under a governing board of Directors, PRO-WEST ranks have grown to over 600 members. There are over 60 sanctioned rodeos throughout the West. The Association believes in our membership - in their ability, their professionalism, their integrity. By the same token, the Association expects, and enforces, high standards of conduct from its members. Any member in violation of these standards is subject to a fine and/or suspension. Cowboys are the world’s finest rodeo athletes. PRO-WEST matches these athletes against some of the best and toughest rodeo livestock in the world. The Association’s stock contractors consistently offer spectators the best rodeo livestock available. This combination of top cowboys and rank stock adds up to the unparalleled excitement of "America’s most dangerous sport." From courageous bullfighters and barrelmen to a selection of veteran announcers, secretaries, and member photographers. 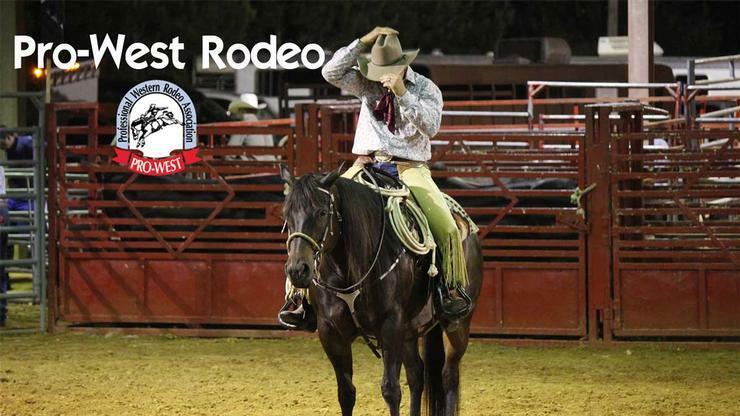 PRO-WEST rodeo offers the smoothest, most-efficiently managed rodeo package available. Even our behind-the-scenes chute help consist of card carrying Association members. Described as "the single most progressive step pro rodeo has taken in the last ten years," the PRO-WEST implementation of a central entry system has been an asset. This system has greatly simplified the complicated logistics of a professional cowboy’s life. Prior to adopting the system much of a PRO-WEST cowboy’s time was spent dialing and redialing, trying to break through the busy signals to reach a distant rodeo secretary. Entering many rodeos a season, a cowboy could win or lose a championship not on his riding ability, but on his telephone skills and luck. With the central entry in effect, today’s contestants usually have to call just one number to enter most rodeos. A rodeo secretary will take down entry information, with each call recorded to trace and to eliminate potential errors. Entries for a given rodeo are taken only on specific dates, with all rodeos and entry information listed in advance by the Association’s official newspaper, Your Competitor News. Ever since a group of cowboys banded together in 1967 to insure fair and consistent judging, prize money, and standards of competition, rodeo committees have played an important role in the success of the sport, through the PRO-WEST. Rodeo committeemen have actively helped formulate PRO-WEST rules and policies. Today, rodeo committees are fully represented on the PRO-WEST Board of Directors. A committee’s success, both financially and in terms of community service, is viewed by the PRO-WEST as a vital element in professional rodeo’s past - and especially in its future growth.